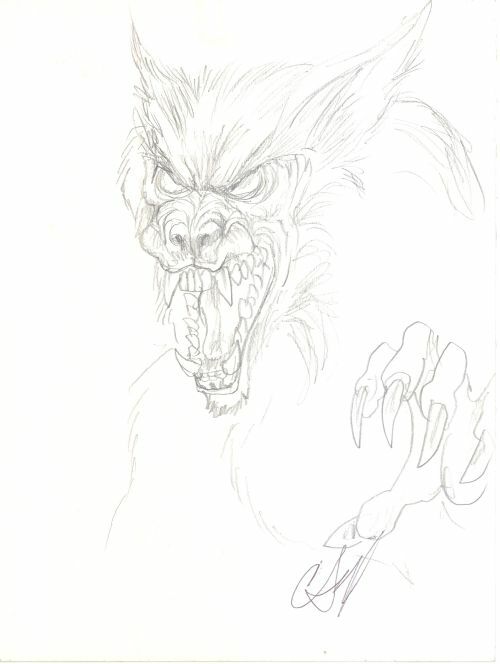 A big "thank you" goes out to artist Chris Scalf for this werewolf sketch that he drew for The Werewolf Cafe. We wanted to let you know that Chris has two websites with many examples of his artwork, one website can be found at www.chrisscalf.com and another website can be found at www.chrisscalf-art.com Between the two websites, you will find many examples of Chris's artwork including commercial illustrations, storyboards, graphic design artwork, sketches, paintings and more. Chris had asked that we post something about "autism awareness" along with his sketch, so we wanted to mention the Autism Society of America website at www.autism-society.org, the Center for the Study of Autism (CSA) website at www.autism.org, and the Autism Research Institute website at www.autismwebsite.com/ari/.